Students silently hold signs displaying quotes during a teach-in hosted by the Black People Making History Committee on Tuesday. The packed event featured discussions about the Black Lives Matter movement. The Black People Making History Committee hosted “Breathe-In,” a teach-in Tuesday focused on the Black Lives Matter movement and blackness in America. Attendees crowded the McCormick Foundation Center Forum for presentations and a panel discussion. “There’s never been a good or safe time in American history for black populations to protest against violence, racism, oppression,” African American Studies Prof. Barnor Hesse, who helped organize the committee, said during the event. The committee is a collaboration within the Center for African American History between faculty and students. Before the presentations, several students silently walked across the stage, holding signs with quotes about breathing. 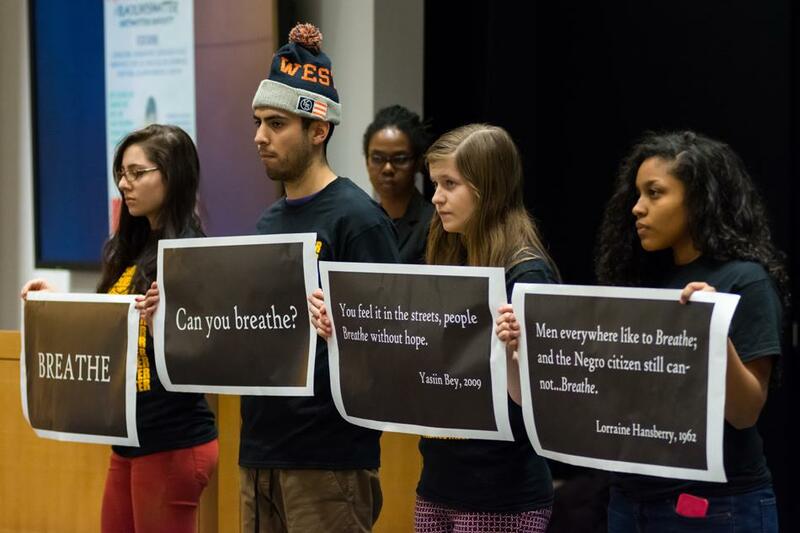 SESP senior Sarah Carthen Watson was last to leave the stage and displayed the repeated phrase, “I can’t breathe” – the last words of Eric Garner, who died in New York City in July 2014 after being put in a police chokehold and whose death has been a fundamental part of the Black Lives Matter movement. After an introduction from Hesse, African American Studies Prof. Sherwin Bryant talked about the lack of discussion about black history in American schools. Bryant also discussed how the interest in black power by prominent leaders of the civil rights movement, like Martin Luther King Jr. and Rosa Parks, are often forgotten to fit a certain narrative. Audience members then watched the video of Garner’s last moments. Kashif Powell, a postdoctoral fellow in the Department of Performance Studies, was the first to give a presentation. During his talk, Powell analyzed the relationship between blackness and death. “While blackness is an entity that is overdetermined by experiences of death, from those experiences emerge a really powerful imaginative force that has the ability to breathe life,” he said. Powell ended his presentation with an original poem. The final presenter, Florence Adibu, spoke about the black experience in America, as well as the importance of women and girls in creating change. At the end of her presentation, she invited audience members to share the names of loved ones, and said, “We speak your name” after each. “How is it possible to be the cradle of democracy and the graveyard of millions of people deemed socially dead at the same time?” said Adibu, a third-year graduate student in the Department of African American Studies. The event then moved into a panel discussion, with five graduate students and faculty members speaking and Hesse moderating. Hesse provided questions and took questions from the audience. In response to a student question about the difficulty of taking care of oneself while working to affect change, panelist Charles Kellom said the former is just as important.